Life in the 21st century seems to be too much for our Press. After a week of the Mail and half of Fleet Street's chatterati reliving the Seventies, the Independent has gone back to the Forties for its splash. Talk about an unfortunate juxtaposition. Did no one stop to think that it wasn't a good idea to have a headline about Britain's Nazi spy network alongside a picture of Cameron and Merkel about to 'mwah mwah'? The story itself, about how MI5 thwarted Nazi sympathisers during the Second World War, is a cracking tale of derring-do that 'can now be told', as the cliche goes, thanks to the release of official papers. Every paper therefore has a version of it (SubScribe, unsurprisingly recommends the Ben Macintyre account in the Times), so what made the Independent think it was a splash, heaven knows. Much more relevant to today's society are the activities of our spies in this century - the collection of millions of Yahoo webchat records from people chosen at random rather than they because they were suspected of wrongdoing. Optic Nerve is another operation disclosed by Edward Snowden and published in the Guardian - with a compelling front-page image. That will be followed up widely, then. The Times splashes on a subject that deserves and requires serious and considered debate. Phone-in maniacs and rabid idiots from both sides should stay silent. The idea is to sell 'legal high' drugs in licensed mainstream shops so that people know what they're buying and sales can be monitored. The key word here is 'legal'. These substances may very well be dangerous, but they are not banned. Discuss. Hamburgers, chips and Coca Cola are also all legal and may also be dangerous when consumed to excess, as the Mirror shows in its splash about obese children being taken into care. These aren't modern-day Billy Bunters - he was positively wiry compared with some of today's youngsters: under-11s who weigh more than 20st. The subjects of the story have been removed from their families to try to return them to a healthy diet. This doesn't sound a satisfactory solution; somehow a way must be found to protect and educate the whole family - although SubScribe does not have a solution. ...and the commentators on the Merkel visit..
Simon Heffer (Mail) Germany’s main collaborator, ever since 1950, has been France. But France is now a socialist basket case, its international credibility shot to pieces, and relations between Mrs Merkel and its president, Francois Hollande, are dire. That is undoubtedly part of the reason why she is keen to maintain such good relations with Britain, at least until France comes under better management. But she will not compromise herself solely to maintain those relations. However brave David Cameron’s face yesterday, this key part of his European strategy is in tatters. Douglas Alexander (Mirror) Angela Merkel was given the red-carpet treatment yesterday but all Cameron was left with was egg all over his face. She offered warm words about Britain, but cold comfort to Cameron and his eurosceptic backbenchers. Philip Stephens (FT) Margaret Thatcher was right. Campaigning to keep Britain in the EU, she declared that Europe opened windows on the world that would otherwise close with the end of the empire. To protect and promote its interests around the globe, Britain needed an anchor of authority and influence on its own continent. That was 40 years ago. Nowadays, it falls to Angela Merkel to make the case for British engagement. 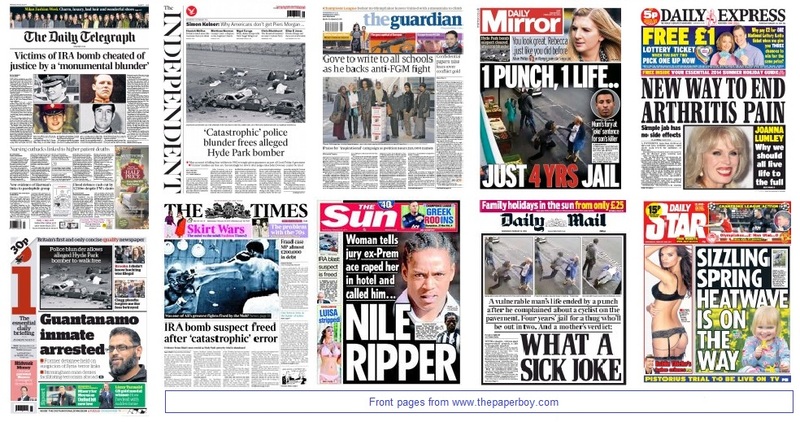 The sentencing of Lee Rigby's killers dominates five front pages, and makes the main photograph in the Telegraph, which prefers the soldier's son and his mother to the mugshots used by most. The Star produces its cleanest page 1 for a long time, with not a breast in sight. But the message? Oh dear. The Mail never loses its capacity to surprise. 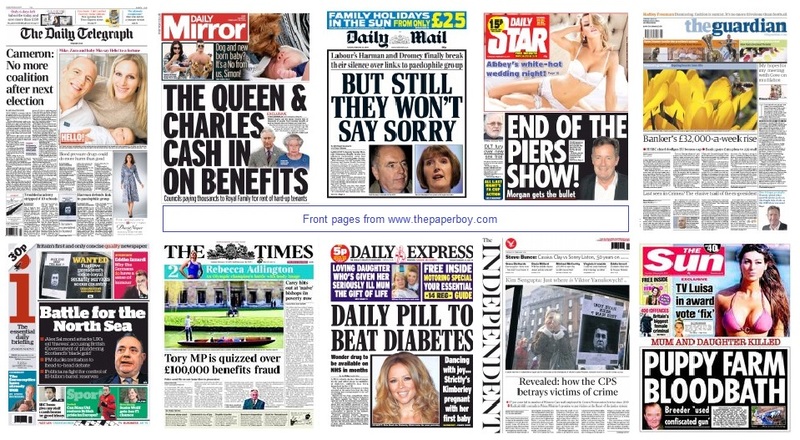 The Woolwich story is right in the heart of Mail territory, yet It is one of only two papers (the other is the Independent) not to have a word about it on page one. Instead it takes Lewis Gill's mother to task for her cavalier response to the furore over his four-year sentence for killing a stranger in the street with a single punch. The Attorney-General is looking into the sentence. The Independent gives its whole front to Russia mobilising 150,000 troops on the border with Ukraine and a photograph of the mass demonstrations in Crimea. The Guardian also has a lot of foreign people on its front - above the titlepiece, indeed. Thousands upon thousands of hungry people who have been blockaded for seven months in the Yarmouk refugee camp in Damascus. The photograph of this giant food queue was released yesterday by the UN agency for Palestinian refugees. The sight of so many people stretching back as far as the eye can see between the ruins of buildings destroyed in the Syrian civil war will, SubScribe predicts, become one of the enduring images of the decade. The rest of this front page is also worthy of note: Sandra Lavalle's measured splash on the women identified as being at high risk of being attacked or killed by their partners, and, for complete contrast, Simon Armitage on the British Museum's new Vikings exhibition. No one does culture as well as the Guardian. Mary Dejevsky (Independent) Without the secret agreement under which 187 people considered wanted IRA terrorists were told, in writing, that they were no longer liable to prosecution, the Good Friday agreement might never have been signed, and the violence, in Northern Ireland and the mainland might have continued. Tim Collins (Telegraph) we must be told exactly what the Blair team agreed to. If the self-appointed executioners of the paramilitaries are to be excused for Hyde Park, where does this leave the pursuit of the soldiers who fired in Londonderry, even after the £200m Saville Inquiry? The answer is “wanted”. James Wharton (Times) the book cannot be closed on the Hyde Park bombing. There must be a full review of this enormous error, and Downey must be brought before the courts. Peter Hain (Guardian) Before politicians and pundits rush to vent their spleen with loose talk of “deceitful deals” by Tony Blair’s government, let’s just keep one fundamental truth to the fore. Northern Ireland today is light years from where it was. Rod Liddle (Sun) There was one thing at which Tony Blair’s Labour government really excelled. And that was striking the sort of backroom underhand deals that stink to high heaven. Always, out of sight of the public, always with the most repulsive individuals imaginable. You know, mass murderers and the like. 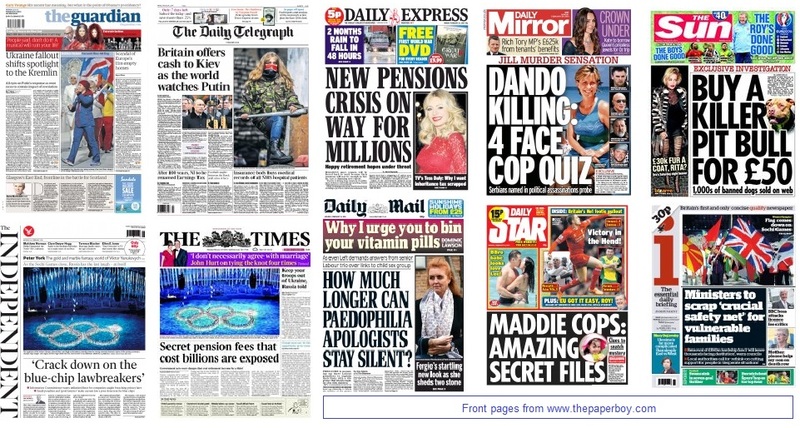 What a fabulous collection of hard news. 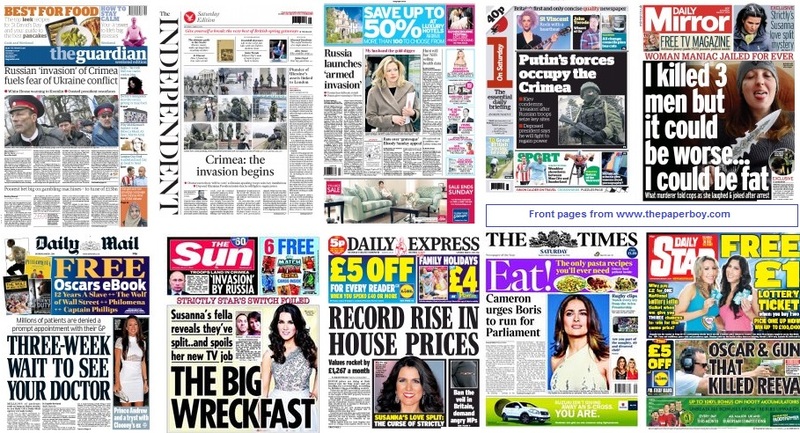 With the obvious exception, every one of these stories is worthy of its place as a splash. Yes, even the spring heatwave. Hyde Park, Guantanamo man, the cyclist killing are all issues with plenty to chew on, subjects that should produce thoughtful argument. 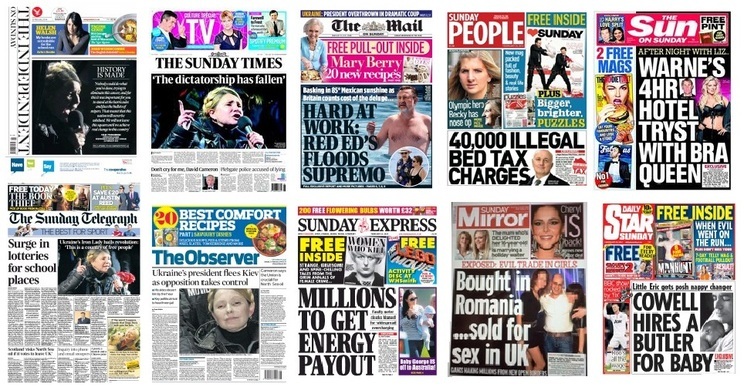 How often do we see the Mirror and the Mail taking the same line? 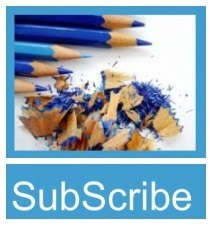 For SubScribe, the story of farthest-reaching importance is the Guardian's report that Michael Gove is finally taking action to get teachers clued up about female genital mutilation. Who would have thought that Malala would have such an impact on our own education system? Pictorially, it's a less inspiring day. The Mail's tryptich stands out, but what a shame it couldn't be bigger - four lines of underscored strapline spoil the page. The Ali fight in the Times is a great story and a great picture, but the whole newsstand looks rather too monochrome. The little girl at the bottom of the Star (as opposed to the bigger girl's bottom) is the most charming image. David Cameron would be mad to rule out the possibility of a coalition. For a party to close off one route to government would be very foolish. Dan Hodges (Telegraph) if Cameron and the Conservative Party wanted to rule out the prospect of governing with the Liberal Democrats, the moment to do it was in May 2010. But they didn’t. It’s much too late now. Stephen Pollard (Express) Voters need to be offered the chance to choose between two clear visions: Labour and the Conservatives. Nothing makes that clearer than a pledge not to continue the coalition. As for the Lib Dems they’ll either be an attachment to Labour, or in the wilderness. Where they belong. that the European elections are contested on proper, EU-related issues. That doesn’t mean obscure clauses of treaties that virtually nobody has ever read. It means money; open-door immigration; our inhibition of global trading opportunities; and how impotent our Westminster Parliament has become in governing UK matters. David Skelton (Guardian) Conservatives should offer a bold, optimistic vision and a combination of compassion, social justice and economic credibility. They should ignore the siren voices about Ukip pacts, which would put the party back for years. remains that a duly elected leader was toppled by a mob. That leader may have deserved all he got. He may have been corrupt, grotesque and murderous, a puppet in the hands of Russia. But he still wore the threadbare tatters of electoral legitimacy, which the demonstrators did not. Roger Boyes (Times) Western help for Ukraine must be accompanied by the democratic transformation of government. It's a big commitment, but the price is not unreasonable if it heads off civil war in Europe. Con Coughlin (Telegraph) We should be wary of Vladimir Putin but not frightened of him. We may ultimately discover that the great Russian bear is little more than a paper tiger. Janan Ganesh (FT) Too many Tories hope that one foreign leader’s goodwill will save them. Hence the breathless microanalysis devoted to the Merkel-Cameron relationship as they banter over football and chuckle in exasperation at the French. Ms Merkel is the most important European leader, someone worth dazzling with London’s grandeur for a diplomatic end, but she is not Charlemagne. MEPs to travel in a more Eurosceptic direction – even at the risk of temporarily riling Angela Merkel. Rachel Sylvester (Times) The Prime Minster is deluding himself if he thinks that the visit of the German Chancellor will save him from his troubled and troublesome party over the next five years. Steve Richards (Independent) The more ardent Eurosceptics are in a state of near-permanent alarm. But their gloom is genuinely baffling. They have won. Their victory is overwhelming. They should be celebrating with good French wine every night. Instead they are tortured by imagined setbacks, and remain neurotically alert to future defeats. The serious four continue to look east, at events in Ukraine and the end of the Sochi winter Olympics. Interest focuses on Putin's next step and Osborne's promise to provide aid if required. Osborne's financial acumen or otherwise also catches the attention of the i, which splashes on council leaders' concerns about the scrapping of the Local Welfare Assistance Fund. There's a lot of secrecy about today: secret pension fees, secret Maddie files and not-so-secret health records and personal data. The most interesting of these is the Independent's interview with the Information Commissioner Christopher Graham, who wishes he had greater powers to tackle big companies who use private detectives to delve illegally into people's affairs. The Times's splash on insurance companies being required to disclose their charges in managing pension funds falls into the category 'aren't they already?' The Express is also on the pension track with a different twist on last week's story about more women being in work. The Express's take is that they are there because they can't afford to retire and as a result of the gradual raising of the state pension age. It's a view. The Mirror and the Star are both trying to solve old crimes. The Mirror revisits the old theory that a Serbian assassin killed Jill Dando. The Star's amazing secret files are just that - a list of burglaries committed in the Algarve before Madeleine McCann's disappearance in 2007. This has apparently been given to British detectives "in the hope their new inquiry may finally crack the case". Haven't we heard this before? We've certainly heard the Mail's splash question before, several times in the past few days. John O'Sullivan (Times) Russian security officials must have prepared “contingency” plans for something like this, but they probably look much more unrealistic today than when they were written. Unless much stronger resistance to Kiev now appears from the east, Mr Putin will find it hard to get a good pretext for intervention. Edward Lucas (Mail) The prospect of Tymoshenko’s political comeback makes me fear for the future of the increasingly unstable and volatile Ukraine. The truth is that her determination is terrifying. Nobody and nothing gets in her way. Dmitri Trenin (International New York Times) Ukraine’s “February Revolution” may be a blessing in disguise for Moscow, as it could help debunk the notion that Russia cannot be a great power without Ukraine as its junior partner. The heavyweights all direct their lenses at the freed Ukrainian opposition leader Yuliya Tymoshenko, three of them unusually opting for white-on-black headings to make the best of the photographs' dark backgrounds. 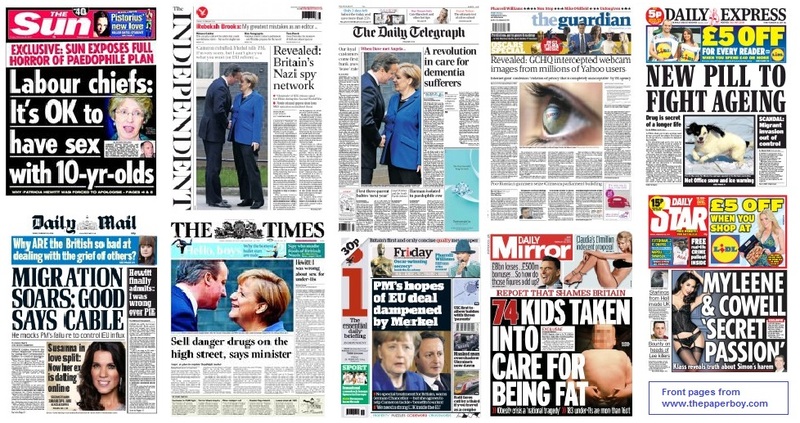 (Is this a first: more 'broadsheets' than pops running reverse heads?) 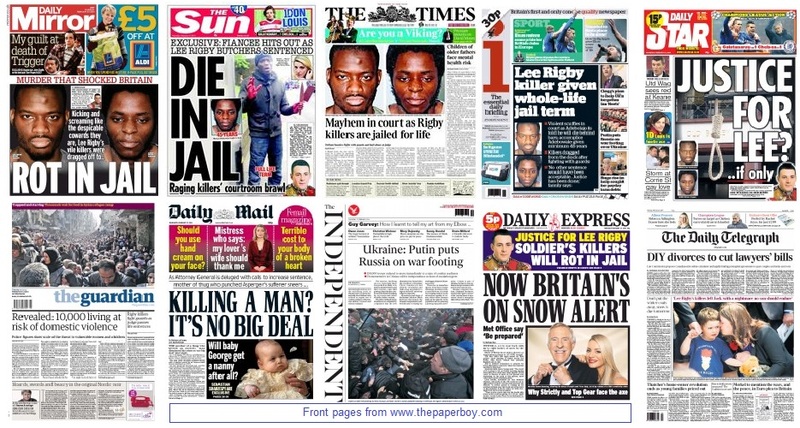 Events in Ukraine moved swiftly yesterday, resulting in a rollicking read in all papers. The Mail turns its guns away from Harman and friends and on to another Labour target, the shadow environment minister Barry Gardiner - the party's spokesman on climate and floods. The paper is outraged that he should be enjoying the Mexican sunshine during the parliamentary recess when he could be here being rude about the environment agency. It devotes four pages to the story, but does not have room to compare Mr Gardiner's globe-trotting and 'junket' expenditure with anyone else, so there is no context. It does, however, report that he has reported his activities to the relevant authorities and that he has not broken Commons rules. "National Crime Agency figures show there were 1,746 reports of human trafficking from 112 countries last year - a 47 per cent leap on the 2012 total." The word 'leap' is probably an acceptable alternative to increase there. SubScribe is not interested in what Shane Warne does in his or anyone else's hotel bedroom, nor in that baby.